When you’re under strict instructions to vary the terrain of your training run, it seems there’s no better place to do it than Brussels: all those rain-slicked cobblestones and tramlines, all those cracked and uneven paving slabs, all those piles and piles of dog muck to avoid. And the hills! You don’t realise quite how hilly Brussels is until you try to get round it under your own steam. So what’s the link between this city and a charity in Manchester? Retrak has had strong ties with Brussels since it was founded back in 1996 by Andy and Katina Williams. At the time, Katina was a primary school teacher and Andy was teaching music at the British School of Brussels in Tervuren. 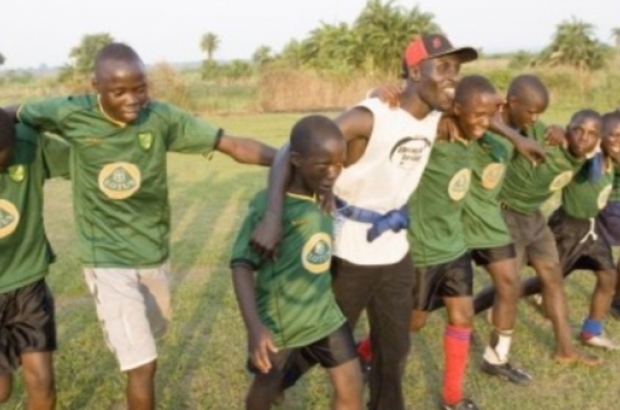 They visited Uganda in 1995 to take over Tigers FC, a football-based community project for street kids in the capital, Kampala, which had been set up by fellow Brits Paul Joynson-Hicks and Matt Winn. Tigers FC became known as the Tigers Club Project, and later Retrak, with projects to help children in Uganda, Ethiopia, Kenya and Tanzania. A major part of Retrak's fundraising each year is the Brussels 20km. The team currently has 10 members and they'd love to recruit more runners to help support their work with vulnerable kids in Africa. Contact Kathleen if you want to join us.